As I’ve got the Microsoft MVP award for another year (beginning October), today I’ve received the (special) “blue ring” – my fifth year of being an MVP. It has been a long road... full of excitements, events, friendships, travels, real-world issues… but it was fun! Once again, I want to thank my girlfriend, my family, my fellow MVPs, my mentors, my colleagues (past and present), wonderful Microsoft people and everyone else who backed me up along this path - THANK YOU, you are the real MVPs, and this award is yours as well! Now… let’s face the new “challenges”! Another great conference is behind us – Advanced Technology Days 10 (or just ATD 10). Two-day conference, Wednesday and Thursday, about the latest and greatest from Microsoft, just in time for some of the important announcements, and with more than a glimpse into the future of technology – pretty cool. I’ve had two sessions – on Wednesday, I’ve had a session called “Što nam donosi Windows Server vNext (Technical Preview)?” (or “What’s new in Windows Server vNext (Technical Preview)?”), where I’ve outlined the major news in this prerelease version of the next Windows Server. There really is a lot to talk about, as Windows Server vNext brings so many news, even in this, somewhat early, stage in development cycle. The session that I’ve had on Thursday was called “Što nam donosi System Center vNext (Technical Preview)?” (or “What’s new in System Center vNext (Technical Preview)?”), and there I’ve shown what is there in Technical Preview today with the preview of the new Microsoft Azure Operational Insights, which also entered the “public preview” phase during the conference. You can sign up and try it at https://opinsights.azure.com/. Overall experience was great – once again located in a movie theatre, with lots of great people, networking, combined with a flawless demo experience (plug ’n’ play) and great timing... actually, I can’t wait for Advanced Technology Days vNext! I’m so happy that I was invited to speak (big thanks to all involved! ), and got the opportunity to participate with my view on all the great stuff included in those releases of very important products. More info is available at http://atd.mscommunity.hr/ and https://www.facebook.com/MicrosoftATD. 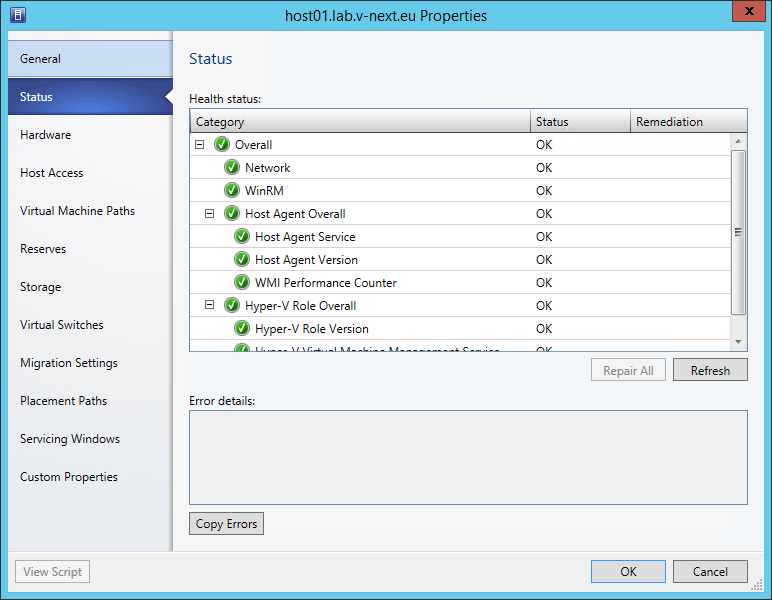 For those who installed the Update Rollup 4 for System Center 2012 R2 Virtual Machine Manager, you may be facing this somewhat “strange issue” right after the installation – your hosts will have the “Needs Attention” status. And now the “strange” part – if you open the host Properties window, and check the Status tab, you’ll may see that everything is green. So, what needs the attention then? The answer is – VMM agent needs the attention, and that’s the cause of this “issue” (you’ll need to run Update Agent action on affected hosts). And, finally, status of your hosts should be OK again.